The Tour du Mont Blanc is one of the most spectacular treks in Europe. Hike 148 kilometres through France, Switzerland and Italy, across five major passes, staying in comfortable hotels and a traditional auberge along the way. Trek among breathtaking mountain scenery on the flanks of Mont Blanc, with views of some of the most dramatic peaks in the Alps. Arriving at Geneva Airport, we transfer in around one hour 20 minutes to our hotel in the village of Les Houches in the Chamonix Valley. There will be a short briefing by our Leader about the week ahead, followed by dinner at a local restaurant. After breakfast we take a local bus for 20 minutes from Les Houches to Chamonix and walk along the River Arve for about 30 minutes to Les Praz (1065 m) from where we take the Flegere cable car up to 1900 m. From here we hike through open countryside for one-and-a-half to two hours to Lac Blanc (2352 m). There are incredible views of the whole Mont Blanc range, including the Grandes Jorasses, Aiguille Vert and Le Dru. We then follow a beautiful path back through the forest to our hotel at Argentiere (1252 m). Today's trekking will take approximately six to seven hours with a cumulative ascent of 450 m and descent of 1110 m.
From the hotel we walk through Old Argentiere and hike up to the Col des Posettes (1997 m) for superb views of Mont Blanc and the Chamonix Valley. From here, we traverse to the Col de Balme (2191 m) and look directly into Switzerland. We then descend through open country with views of glaciers to Trient (1297 m) and then on to La Forclaz (1526 m) where we spend the night. You will have your main baggage delivered to the hotel tonight. Today's trekking will take approximately five to six hours with a cumulative ascent of 980 m and descent of 894m. We hike along the Bovine Route to Champex (1486 m). The route winds its way through meadows, forests and open country with views of the great Sion Valley and the mountains of Verbier. There are no great ascents today and we arrive at our hotel near Champex Lake where you can head to for a sundowner. You will not have access to your main luggage tonight. Today's trekking will take approximately five hours with a cumulative ascent of 540 m and descent of 600 m.
From here it is a gentle five to six hour trek to La Fouly (1600 m) along the Val Ferret. We start our walk descending from Champex following the river along a pretty valley covered in trees to Praz-de-Fort. We then ascend in similar surroundings with wonderful views of Mt Dolent and the South Face of the Mont Blanc range. You will not have access to your main luggage tonight. Today's trekking will take approximately five to six hours with cumulative ascent of 540 m and descent of 440 m.
We continue from La Fouly along the Val Ferret and cross the impressive Grand Col Ferret (2537 m). From here, the descent is slightly steeper but rewards us with outstanding views of two of the Alps most iconic mountains - Le Grandes Jorasses and Mont Blanc. We stay at La Palud (1350 m), 3 km from Courmayeur and you will have your main baggage delivered to the hotel tonight. It's worth noting that it's possible to shorten today's walk by taking a bus for the final seven kilometres of the walk. Today's trekking will take approximately nine hours with a cumulative ascent of 830 m and descent of 1170 m.
Today has been left free to take a rest from the trail and soak up the ambience of the Alps. Nearby Courmayeur is one of Italy's premier ski resorts and is full of pretty shops, cafés and restaurants. Close by, there is the hot spring spa at Pre St Didier, the Skyway cable car that revolves as you ascend and plenty of other walking opportunities. We take two public buses (approx 10 and 20 minutes each) and travel to Val Veny under the spectacular South Face and ridges of Mont Blanc. We trek along a wide glacial valley surrounded by glaciers and high peaks to the Col de la Seigne (2516 m) which marks the border between France and Italy. We then descend to Les Chapieux (1549 m). Today is quite a long day (it is possible to take a bus for the final five kilometres if you wish) , although it is not steep. You will not have access to your luggage tonight, so you will want to pack accordingly. Today's trekking will take approximately seven hours with a cumulative ascent of 860 m and descent of 967 m.
We make a steep ascent above Les Chapieux through marmot country and on through open meadows to more barren scenery. We cross two cols (2479 m and 2329 m) in wild surroundings with fabulous Alpine Flowers and marmots, weasels and chamois. We then head down through open country and a narrowing valley. Our destination is Les Contamines (1167 m) - a pretty ski village with an interesting church. We will stay approximately 1 km before the village of Les Contamines. There will be no access to your main luggage tonight. Today's trekking will take approximately six to seven hours with a cumulative ascent of 850 m and descent of 1320 m.
Leaving Les Contamines we follow the Tour du Mont Blanc, passing the pretty hamlets of Gruvaz, Champel and Bionnassay. We then make the short, 500m ascent to the Col du Voza (1653m) which forms part of the huge massif above Les Houches. This is a fitting end to our trek with the most outstanding views of the Chamonix Valley, the Chamonix Aiguilles and the Mont Blanc massif. We descend from the col to the road at Les Houches and either walk (20 minutes) or take the public bus back to the hotel in Les Houches where we started our trek nine days ago. We are reunited with our luggage and will have a final nights meal in the evening, bidding farewell to our Leader. Today's trekking will take approximately seven hours with a cumulative ascent of 500 m and descent of 700m. Transfer to Geneva Airport where our trip ends. Summers are generally warm, or even hot, with a three-month period when rain rarely falls. When it does rain in this season, it is heavy and often accompanied by thunder. There are as much as eleven to twelve hours' sunshine a day in summer, but as with anywhere in mainland Europe it can occasionally be cold and wet. Early and late summer is generally the best times to visit this region. The following are essential for your tour: Good quality waterproof jacket and trousers (e.g. Gore-Tex / e-Vent), a pac-a-mac is not good enough, fleece jacket, comfortable walking trousers, shorts, warm hat and gloves, sunhat, sunglasses and high factor sun cream. Please be aware that temperatures can change dramatically at altitude and at night. For around-town wear in Chamonix, you may wish to bring some slightly smarter clothes. You will need walking boots with proper ankle support and good tread. Trekking shoes are not good enough for the walks as they do not give ankle support. In addition, you should avoid cheap boots found in high-street shops that are merely trainers with a higher canvas side sewn on. Make sure that your boots are worn-in and comfortable before the start of the trip. Also trainers or sandals for relaxing and general wear. We suggest that on international flights you either carry your walking boots in your hand luggage or wear them - should your luggage be lost or delayed, your own boots are the one thing that will be irreplaceable. One main piece of baggage and a waterproof daypack. A capacity of 40 litres is recommended as you will need to carry enough overnight clothes (spare underwear, T shirt and toiletries etc) for the nights when you will not have access to your main luggage (days 4,5,8,9). There are showers at every night stop. You will need a resuable water bottle (preferably 2 litres), torch, insect repellent and high factor sun cream. You may like to bring trekking poles. It is a good idea to line your daysac with a good quality plastic bag. This will go a long way in protecting your gear from any rainstorms we encounter. Tap water is safe to drink from the hotels and auberges, but water sources along the trail may not always be drinkable. Using tap water rather than bottled water will help avoid creating plastic bottle waste. Energy snacks including chocolate and sweets are recommended whilst on trek as well as a lunch box/Tupperwear for picnic lunches. Towels are not provided at Les Chapieux though you can hire one for €1: we suggest that you bring an easi-dry towel as they are lightweight and easy to carry. You may also wish to bring a sleeping bag liner for the stay at the auberge. Equipment Hire and Trek Training Days - Trek Hire UK hire out a wide range of kit including quality sleeping bags, down jackets, therm-a-rest sleeping mats and walking poles http://www.trekhireuk.com. They also run regular trek training and preparation days from their base in the Surrey Hills, ideal for getting an indication of your overall fitness level and also covering advice on kit and altitude. Service is included in French restaurants, although it is polite to tip 10% if the service has been very good. Bar staff and café waiters expect a small tip or loose change. In Italy service is not included - allow 10% - and they also have a cover charge, or coperto, of 1 or 2 euros which is obligatory and literally pays for you to sit down. Local currency can be obtained using credit cards in ATM's. We stay at small, family-run hotels for nine nights and in a traditional auberge (guesthouse) for one night. In the hotels you will usually be accommodated in twin rooms with private bathrooms, though occasionally you may have the use of a shared bathroom along the corridor. At Les Chapieux we stay at an auberge: this is a traditional mountain inn that is clean, friendly, full of fellow trekkers and has a great atmosphere. At the auberge we aim to have twins, triples or quads, but you may be in a dormitory if it is a busy part of the season. The bathrooms are shared. All bedding is provided. Most meals are included at the hotels and auberge and will be a fixed three or four-course meal with vegetarian options. Drinks are not included, but all hotels have a selection of wines, beers and soft drinks. France: Visas are not required by UK, EU nationals, Australian, New Zealand, US and Canadian citizens. Italy: Visas are not required by UK, EU nationals, Australian, New Zealand, US and Canadian citizens. Switzerland: Visas are not required by UK, EU nationals, Australian, New Zealand, US and Canadian citizens. Nothing compulsory; Tetanus recommended. The above is not an exhaustive list. Further information regarding vaccinations and travel health advice can be found by following the NHS and NaTHNaC links at http://www.explore.co.uk/Travelhealth/ and from your local healthcare provider. 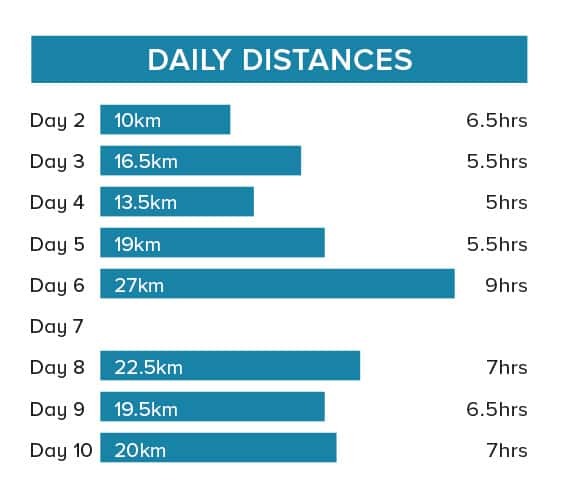 This is an 8-day trek with an average of 6 to 8 hours of walking a day. We will make climbs and then descents of around 1000 m on five of these days , reaching a maximum altitude of 2,537 m. On days 6 and 8 there is the option to shorten the total walking by catching a bus for the final few kilometres.